My family and I recently returned from a great trip to Turneffe Flats, Belize. I had not been here in many years, and thanks to the nice folks at the lodge my entire family was able to accompany me. You probably know Turneffe as one of the longest running, and most reputable saltwater destinations in Belize, if not the planet. 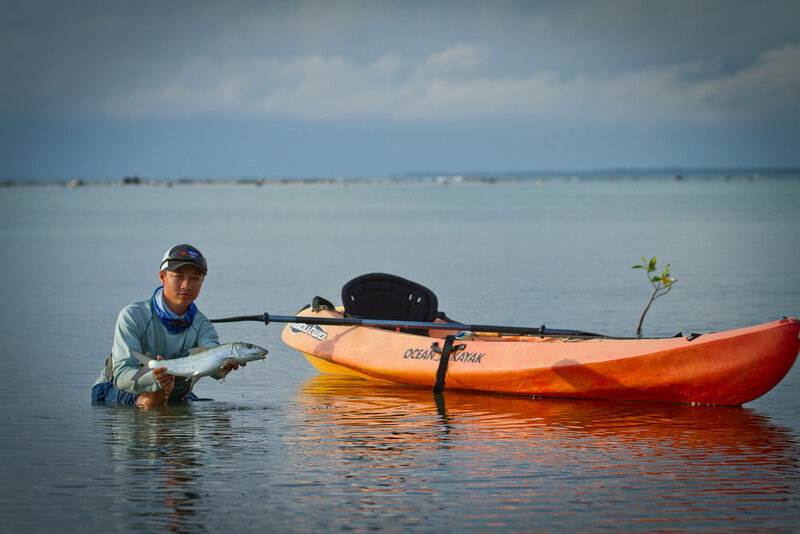 Besides having Bonefish, Permit, and Tarpon all months of the year, Turneffe is almost unique in being a destination that both anglers and non-anglers can enjoy. That meant scuba diving and snorkeling for my boys, as well as looking in channels for manatees, and even going on a crocodile hunt one night. And by the way, they found LOTS of crocodiles! Many Thanks to Craig and Karen Hayes, Jad, Nick and all the crew at Turneffe for a wonderful trip. Everything at Turneffe is well maintained and manicured, even after the recent hurricane! Our weather started out a bit sketchy. Here, Greger and Pops at the reef with big breakers in the background. Pops and Greger on point when a small Permit shows up. Kayaks are always available at Turneffe. My boys used them morning and evening to fish the home flats. Teddy is a fanatic. He fished every morning before the real day began. He managed to fool a couple nice home pool fish like this. One of the dive boats takes clients on another epic dive at Turneffe. Diving is exceptional at Turneffe. Greger did 2 resort dives with his instructor Jamani. During a stop for lunch at Half Moon Caye, we got to see lots of Iguanas and nesting birds. Half Moon Caye is an important nesting site for Blue Footed Boobies (he said Boobies!). Staff at Turneffe is exceptional. Greger posing with the resident naturalist, Abel, dive instructor Jamani, and the boat dive master. Pops showing Teddy where to put the cast. Pops is now 67 years old. I wonder how many Turneffe Bonefish like this he has seen landed? Permit are plentiful at Turneffe. The interior bays and mangrove edges would hold schools of Permit like these. Greger and Pops watch a Bonefish make a rooster tail across the flats. Fran got in the action trolling for Barracuda. Abel and customers on their way to look for Manatees. I think we saw 5 that morning! Naturalist Abel was a wealth of knowledge. Here, he shows a new snorkeler a sea star from the flats. Afternoon showers are common during the summer. I thought they were really beautiful. Skiffs and dive boats moored at Turneffe.